Saline ground water is a major problem in Gujarat, India. Especially for poor people at the Base of the Pyramid (BoP) for which this groundwater is the only source of drinking water. They do not have the funds to buy clean bottled drinking water and lack the saving for investing in purification machines themselves. Their income is on average 3-4 euro/day and they simply have to cope with the situation and consume the brackish water whcih is provided for free. Consumption of saline water is having serious health effect especially on pregnant woman, elderly and children: Painful joints, high blood pressure, brittle bones and stomach problems are among the health effects frequently noticed. It is important to try and change this situation for the long term sustainably. Together with our business partners Cordaid and EPGL we undertook action in 10 Gujarati villages. 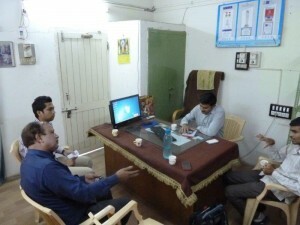 In discussion with local villagers we developed a new business model to provide good quality water to rural vilagers. Based on that model we then selected the technology, installed it in the selected places and started to operate the water shops. Saline water is now purified using a reverse osmosis system and local villagers buy the water at a price of 0,35 INR or 0,0047 euro/liter. Payment is done automatically and people pay for the water using an debit card. New credits can be simply bought in the nearby grocery store. Interested to set up your own water shops? We deliver the full package to set up your own chain of sustainable water shops. From technology to business model based. Let us know.